hi cherry, my name is mayme. i am 11 yrs old, i have been riding for 3 or 4 yrs. about 3 yrs ago i got a horse for christmas. one day my sister and i were riding, i started to lope to my sister, but i lost control and fell off. luckily we were just down the street and my horse ran home. since then i will lope but im not very comfortable doing it. i’m scared i wont be able stay in control and or be able to stop. i will lope on my sister’s horse but i still dont really like it. it’s not that i dont like my horse it’s just that i dont really trust him. my horse is kind of old if that changes anything he is around 21 yrs old. i hope you can help. thank you for your time and your suggestions. have a good day and GOD BLESS!! This is a common problem but one that is easily overcome. The best solution is to get back on and do more loping ! I know that sounds oversimplified, but really that is the solution. Of course, it should be done in a controlled situation so you can get your rhythm and confidence back. Sometimes just taking a few lessons on a “school horse” will help you figure things out and relax. But here are some specific tips. Knowledge is power. So start by reading up on loping and confidence. 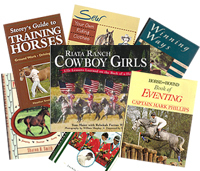 Here on this blog, there are two search boxes one just above the book How to Think Like a Horse and the other is in the right hand column about half way down. In either of those boxes, you can type key words to find articles related to your area of interest, such as “loping”. That search turns up an article Overcoming the Fear of Loping. You can click on the title here and it will take you to that article. You can do the same sort of search on my website Horsekeeping where I have posted hundreds of articles. By browsing through articles, you will gather ideas that will be suitable for YOU. Then when you get back in the saddle, you will KNOW that loping is nothing to fear. All you will need to do is practice it until it becomes as natural as walking. As I mentioned earlier, it would be best if you took a few lessons from a qualified riding instructor to help you develop the skills necessary for loping. And above all, don’t forget to breathe regularly when you are riding. If you hold your breath, it can make you stiff and pop you right out of the saddle. So breathe in and out……..ahhhhhhhhh…….and enjoy that wonderful lope !